Recovery of Snake River sockeye salmon could take 50 to 100 years and over the next 25 years cost over $101 million, according to a Snake River Sockeye Salmon Recovery Plan released Monday by NOAA Fisheries. "The species remains at risk of extinction," says NOAA Fisheries of the fish first listed as endangered under the federal Endangered Species Act in 1991. Today, NOAA Fisheries "estimates that recovery of Snake River Sockeye Salmon could take 50 to 100 years." The recovery plan contains an extensive list of actions to recover the populations. However, it recognizes that there are uncertainties involved in predicting the course of recovery and in estimating total costs over such a long recovery period. "Such uncertainties include biological and ecosystem responses to recovery actions, as well as long-term and future funding." The recovery plan says "it is most appropriate to focus on the first five years of implementation and in five-year intervals thereafter, with the understanding that before the end of each five-year implementation period, specific actions and costs will be estimated for subsequent years." The recovery plan discusses cost estimates for all projects judged to be feasible and projected to occur over the initial five-year period of implementation, fiscal years 2014 through 2018. It also estimates the total cost of recovery over the next 25 years. "The estimated total cost for implementation of all actions during the initial five-year period, FY 2014 to FY 2018, where costs are available, is approximately $20,293,955. "The total estimated cost of recovery actions for the ESA-listed Snake River Sockeye Salmon ESU over the next 25 years is projected to be about $101,469,775." 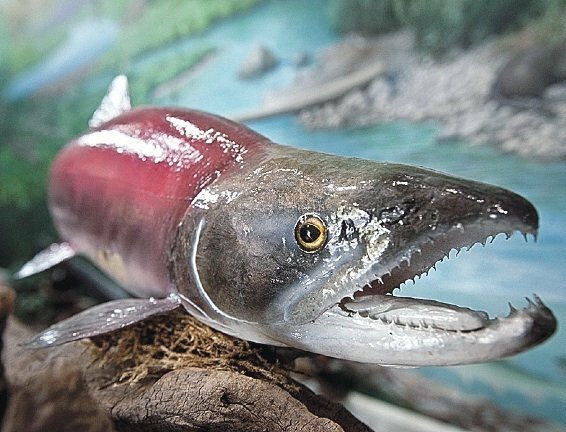 The plan outlines strategies and actions intended to recover the endangered species known for swimming some 900 miles up the Columbia, Snake and Salmon rivers to a level of 6,500 feet above sea level to spawn in Redfish Lake in the mountains of central Idaho. NOAA Fisheries will use the plan to organize and coordinate recovery of the species in partnership with state, tribal and federal resource managers. The recovery strategy for Snake River sockeye salmon contains elements to address limiting factors and threats at the local level (Sawtooth Valley and upper Salmon River) and the regional level (the mainstem lower Salmon, Snake and Columbia Rivers and estuary, and plume and ocean). A safety net hatchery program operated by Idaho Fish and Game and funded largely by the Bonneville Power Administration focused on preserving what was left of the species and began gradually rebuilding sockeye numbers. The Snake River Sockeye Salmon Captive Broodstock Program started in 1991, six months prior to NOAA Fisheries' November 1991 listing of the species. The multi-agency and tribal effort was initiated to conserve and rebuild the Redfish Lake sockeye salmon stock in the Sawtooth Valley of central Idaho. Historically, five Sawtooth Valley lakes -- Alturas, Pettit, Redfish, Stanley and Yellowbelly -- supported sockeye salmon. Restoration efforts today are focused on Alturas, Pettit, and Redfish lakes. Between 1991 and 1998, all 16 of the natural-origin adult sockeye that returned to a weir at Redfish Lake were incorporated into the captive broodstock program, as well as out-migrating smolts captured between 1991 and 1993, and residual sockeye captured between 1992 and 1995. The program has used multiple rearing sites to minimize chances of catastrophic loss of broodstock and has produced several million eggs and juveniles, as well as several thousand adults, for release into the wild. The Sawtooth Valley is seeing results from the captive broodstock program, says the recovery plan. "Sockeye Salmon returns to the valley have increased, especially in recent years, to 650 in 2008 (including 142 natural-origin fish), 833 in 2009 (including 85 natural-origin fish), 1,355 in 2010 (including 179 natural-origin fish), 1,117 in 2011 (including 142 natural-origin fish), 257 in 2012 (including 52 natural-origin fish), and 272 in 2013 (including 78 natural-origin fish). "However, while the program has successfully prevented extinction and preserved the genetic lineage of Redfish Lake Sockeye Salmon, the species remains at risk of extinction. Snake River Sockeye Salmon cannot be said to be recovered until it is made up of natural-origin fish spawning in the wild and surviving their two-way journey in far greater numbers." 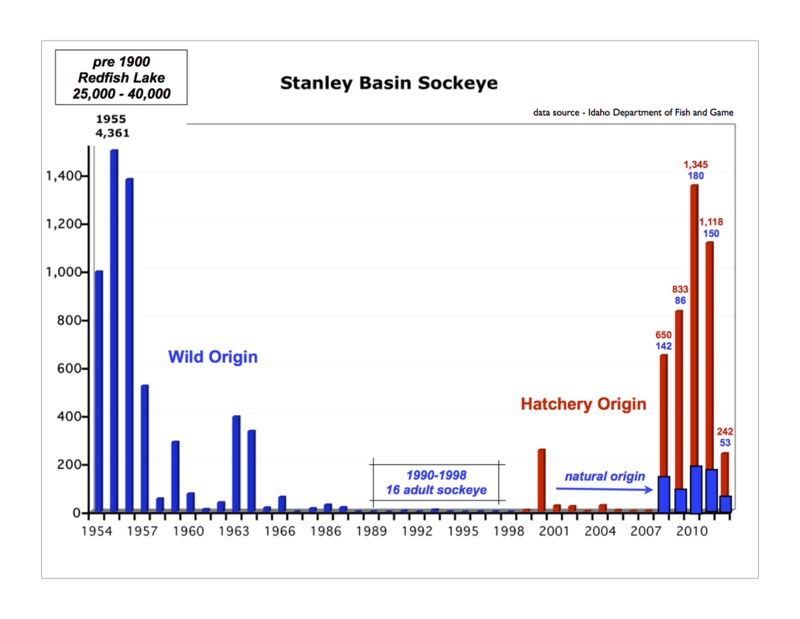 Two years ago a new sockeye hatchery in Springfield, Idaho, came on line with the capacity to dramatically expand releases of juvenile sockeye, which is expected to further increase returns to the lakes in Idaho's Stanley Basin. NOAA Fisheries has appointed teams of scientists with geographic and species expertise to develop recovery plans for each of the 13 Columbia River Basin ESA-listed species of salmon and steelhead. The team responsible for Snake River sockeye salmon -- the Interior Columbia Technical Recovery Team (ICTRT) -- includes biologists from NOAA Fisheries and several states, tribal entities, and academic institutions. The recovery plan released Monday, says NOAA Fisheries, is required to satisfy the requirements of section 4(f) of the ESA. It describes: 1) recovery goals and objective, measurable criteria which, when met, will result in a determination that the species be removed from the threatened and endangered species list; 2) site-specific management actions necessary to achieve the plan's goals; and 3) estimates of the time required and cost to carry out the actions needed to achieve the plan's goals. It also includes direction for monitoring and evaluation and adaptive management to "fine-tune the course towards recovery when needed." NOAA Fisheries' biological review teams have concluded that the decline of the Snake River sockeye salmon is the result of widespread habitat degradation, impaired mainstem and tributary passage, historical commercial fisheries, chemical treatment of Sawtooth Valley lakes in the 1950s and 1960s, and poor ocean conditions, says the recovery plan. "These combined factors reduced the number of sockeye salmon to the single digits. The decline in abundance itself has become a major limiting factor, making the remaining population vulnerable to catastrophic loss and posing significant risks to genetic diversity." The recovery plan says the Columbia and Snake River hydrosystem remains a threat to the viability of Snake River sockeye. "Four federal dams on the lower Snake River mainstem (Lower Granite, Little Goose, Lower Monumental and Ice Harbor) and four federal dams on the lower Columbia River mainstem (McNary, John Day, The Dalles and Bonneville) limit passage for juvenile Sockeye Salmon migrating to the ocean, and adult Sockeye Salmon returning to their natal lakes." "All eight dams are part of the Federal Columbia River Power System (FCRPS). Specific limiting factors that impact viability include mortality and delayed upstream passage (adults), direct and indirect mortality on downstream migrants (juveniles), alteration of the hydrograph and riverine habitat, delayed migration and reduced survival due to high water temperatures, and predation by birds, pinnipeds, and non-native fish species. Some incidental take of Snake River Sockeye Salmon occurs in mainstem fisheries. The length and duration of the Snake River Sockeye Salmon migration (approximately 900 miles) also increases their risk of exposure to agricultural and industrial chemicals." Juvenile migrant survival, Sawtooth Valley to Lower Granite Dam: Juveniles migrate quickly through the Salmon River to Lower Granite Dam. Estimated survival of hatchery juveniles in the reach has been highly variable, ranging from 11.4 percent in 2000 to 77.6 percent in 2008. Juvenile survival from Lower Granite to Bonneville Dam since 2008 has ranged from 40 percent to 57 percent. Within this reach, mean survival is estimated at 60 percent from Lower Granite to McNary Dam (1996-2010) and at 54 percent from McNary to Bonneville Dam (1998-2003, 2006-2010). Juvenile and adult migrant survival, estuary, plume and ocean: Survival rates for Snake River Sockeye Salmon during this life stage remain unknown due to small numbers of migrants. Adult migrant survival, Bonneville Dam to Lower Granite Dam: Estimated survival rates for 2010-2013 show that survival averaged 56 percent to 83 percent from Bonneville to McNary, 92 percent to 99 percent from McNary to Ice Harbor, and 71 percent to 97 percent from Ice Harbor to Lower Granite. Adult migrant survival, Lower Granite Dam to Sawtooth Valley: Estimated survival rates for PIT-tagged sockeye show that 73 percent of the adults that passed Lower Granite Dam (2008-2012) were recovered at Redfish Lake, the Sawtooth Hatchery weir or other locations. NOAA Fisheries says the immediate goal of the plan is ESA delisting. "Once the fish achieve recovery under the ESA, the recovery plan will help meet broader goals." These "broad sense" goals, says the agency, "may go beyond the requirements for delisting to acknowledge social, cultural or economic values regarding the listed species." "Biological recovery for a salmon species means that it is naturally self-sustaining -- enough fish spawn in the wild and return year after year so they are likely to persist in the long run, defined as the next 100 years. The species also has to be resilient enough to survive catastrophic changes in the environment, including natural events such as floods, storms, earthquakes, and decreases in ocean productivity."